Erpeton tentaculatus Lácèpede, 1800: 169. Holotype: MNNH. Type locality: none given. Rhinopirus tentaculatus: Merrem, 1820: 82. Homalopsis herpeton: Schlegel, 1837a, 2: 359. Herpeton tentaculatum: Jan and Sordelli, 1860: 1, pl. 1. Herpeton herpeton: Giebel, 1861: 110. Distribution: Southern Thailand, Cambodia, southern Vietnam (Murphy, 2007). Diagnosis: Prominent paired rostral appendages; dorsal scales in 34 – 39 at mid-body, heavily keeled; ventrals very narrow with keel on each side (left and right) readily separate this snake from all other homalopsids. The largest snake measured was a female with a total length of 767 mm with a 231 mm. The largest male measured had a total length of 724 mm and a 246 mm tail. Morice (1875b) reported a snake with a total length of 0.92 m, with a 0.22 m tail. The smallest specimen he reported had a 213 mm SVL and a total length of 273 mm. Martinez and Behler (1988) found neonates ranged in length from 197 - 244 mm. The tail is proportionally the longest in any homalopsid; and combining all populations the T/SVL ratio is 43 - 59% in males, and 33 - 44% in females. However, populations vary in this trait. At the base of the tail the width is 72% of the height based upon the average of five specimens. The head is distinct from the neck and it is depressed. The snout is blunt and forms a right angle to the face. There are two scale covered rostral tentacles that are 4 - 5 mm long on adults. These tentacles make this the most readily recognizable snake on the planet. The eyes are relatively large and lateral; and its diameter is greater than the eye-mouth distance, the only described homalopsid having this character state. In dorsal view the eyes bulge from the side of the face. The body is depressed, and some individuals have the lowest ventral count for any homalopsid (some have as few as 91 ventral scales), it will be interesting to see if these correlate well with vertebrae. On the head the rostral scale is divided into 2 - 6 small scales in the material examined. The nasal scales are slightly raised above the surface of the crown; they may be in contact with each other or separated by smaller scales; smaller scales surround the perimeters of the nasal scales. The internasal scales are paired, they are posterior to the nasals and they are smaller than the nasals; and each contains a raised keel or tubercle (in both sexes). There may be an azygous scale between the internasal scales and the prefrontal scales. The prefrontal scales are larger than the internasal scales and about equal in area to the nasals; they also contain keels or tubercles. The frontal is short, about 63% of the interocular distance; it is also smooth, lacking keels or tubercles. The parietals are large and smooth. The supraocular scale is single and smooth, and is separated from the frontal and parietal by small scales. The preocular scale is usually single, but part of the divided upper labial may enter the orbit below the preocular, thus producing two preoculars; subocular scales number 2 - 3, postocular scales number 3 - 4. The loreal region is composed of two rows of scales; the upper row may be much larger than the ventral row; these scales also have a keel or tubercle. The temporal region contains numerous small scales, in the area of the primary temporal there may be 3 - 4 small scales that are keeled. The upper labials are keeled, divided, and number 10 - 16. On the chin the lower labials are also divided and may be keeled and tuberculate. They number 13 - 22, and they exhibit some geographic variation. Cambodian populations have 13 - 18 (13 - 8%; 14 - 21%; 15 - 25%; 16 - 25%; 17 - 12.5%; 18 - 4%), while Thailand populations have 17 - 22 lower labials (17 - 12.5%; 18 - 25%; 19 - 31%, 20 - 12.5%; 21 - 12.5%; 22 - 6%). Chin shields number 1 - 4, with a single individual showing the range of variation (one chin shield on the right side, four on the left). These scales are keeled and tuberculate in some males; thus, tubercles may be seasonal. Gular scales blend into the ventral scales and extend well onto the body. On the body the dorsal scales are elongate, heavily keeled, and they number 34 - 39 on the neck, 34 - 39 at midbody, and 29 - 35 near the vent. No pattern, geographic or sexual, was found associated with the dorsal row counts. The ventral scales are very narrow and bicarinate. They are about 1.5 times the width of a nearby dorsal scale. They number 91 - 122 and they vary geographically (see Table 15. The Cambodian population shows sexual dimorphism in the number of ventrals, while the Thailand population does not. On the tail the subcaudal scales are divided and number 94 - 140 in males and 89 - 127 in females. However, there is a geographic pattern to this variation. Color and Pattern. Soderberg (1966) reported that most Thai specimens are orange with brown markings and white spots, while some specimens are black with gray markings and white spots. He reported three captive females that gave birth, each litter was composed of young with both of these color morphs, and considered the color morphs distinct and suggest the coloration does not change with age. Specimens examined were almost uniform orange or brown in color; and some had yellow cross bars on the anterior body with each cross bar bordered with black posteriorly, these bars are usually less than one scale row wide, and they fade posteriorly. Dark brown blotches, 2 - 5 scale rows wide, and spaced 2 - 3 scale rows apart may be present on the sides and extend onto the tail. Other specimens have complex patterns of stripes on the dorsum and venter. All of these patterns are represented in a sample of 17 specimens examined from Cambodia. The tentacled snake uses stagnant or slow moving bodies of water. The habitats examined contained substantial amounts of emergent-submergent vegetation; it seems likely that this species rarely leaves the water. The literature supports this view. Morice (1875b) wrote, "This snake is calm in movements; it spends its life among aquatic plants, and it undulates in the same manner as the plants following the current..." Campden-Main (1970) considered it, "...entirely aquatic..." Cox (1991) stated that it, “...prefers living in slow moving water." Smith (1943) wrote, “It is not uncommon in ponds and sluggish waters in the country round Bangkok if one knows where to look for it, and, according to Bourret it is not rare in Cambodia and Vietnam (Cochin China). It is entirely aquatic in its habits and on land is almost helpless. Taylor (1965) stated, "It is aquatic, living in ponds, klongs and slow moving streams." As the common name, fishing snake, suggests this species is strictly piscivorous. Shaw (1965) observed feeding behavior of adults and neonates in captivity and found that they both patiently wait in an immobile, rigid posture for fish to venture close enough to be seized. Cornelissen (1970) suggested that the fish was partially swallowed with the strike. I videotaped feeding strikes of this species in an aquarium using medium sized (3 cm) Betta splendens for prey and found that prey handling time was very short or virtually non-existent. On some of the successful strikes the fish disappeared within a single frame; the frame speed was 1/30th of a second. Smith et al. (1998, 2002) filmed feeding Erpeton and found pre-strike tongue flicks rare, usually the snake remained motionless with tentacles extended and waited for the fish to move into a specific area before striking. The strike was launched from a preset J-shaped posture that involved the head and neck turning back toward the body. As the head traveled toward the fish, the mouth opened and water collected in the throat causing it to balloon. The fish was secured on buccal teeth and quickly swallowed by unilateral displacements of the jaws. They suggested that the head, jaw, throat, and glottis exhibit features that are hydrodynamic for underwater strikes. Literature accounts of this species frequent describe vegetation in the gut. Morice (1875a) stated that the Annamites believe it to feed on fish and an aquatic plant that they call Rau Giua, Cubospermum palustris of Loureiro, which is Jussiaea repens (Paul Gritis suggested this plant is Ludwigia adscendens). Morice said the plant is common in the brackish water of lower Cochinchina, and he claims to have placed this plant and an Erpeton together in a pot and in a few days the plant was reduced to "...some filaments attached to the stem." He also reported plant remains in the stomach and intestines of this species. These same observations are repeated in his 1875b account with the addition that frogs are eaten, and that he observed one specimen to eat a tadpole. He also stated that the intestines are more convoluted than in most snakes. 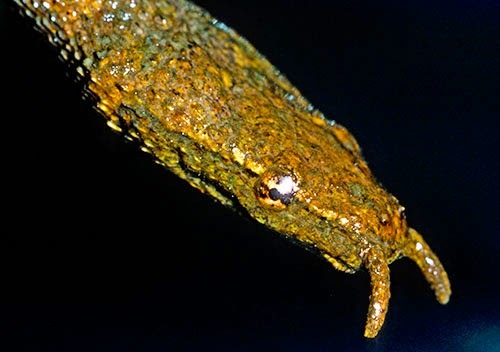 Neill and Allen (1956) found algae in the stomach of this snake and suggested accidental ingestion to explain its presence. Saint Girons (1972) also found plant debris in the stomachs of specimens he examined. Having observed the explosive strike of this snake, it is not surprising that this species swallows anything in the path of the strike and given the kind of stagnant, vegetation dense water it inhabits plant material in the stomach is not at all surprising. However, this snake is not herbivorous or omnivorous as suggested by Morice; ingested vegetation is quite accidental. Cornelissen (1970) noted that the fish is not chewed (common behavior for other homalopsids), and described a fish escaping, apparently unharmed, from a snake that had swallowed it after he had picked-up the snake after it had eaten. He also reports these snakes are often coated with a growth of algae; this was also observed this in the specimens obtained at Thale Noi, Thailand during this study. The tentacles of this snake are highly distinctive and have been the subject of much speculation. Ken Catania has experimentally shown that Erpeton has a unique feeding mechanism and that the tentacles are a highly sensitive organ used to detect vibrations in the water. Erpeton has litters of 5 - 13 young based upon the literature (Morice, 1875a; Smith, 1943; Campden-Main, 1970). Martinez and Behler (1988) reported on seven litters born at the New York Zoological Park; parturition occurred from early July to early October; litter size ranged from 5 - 12 (= 7.9); neonates ranged from 197 - 244 mm in total length, and from 2.4 - 5.0 g. Courtship was observed only once, on 24 February. Humans are the only known predators of Erpeton; Stuart et al. 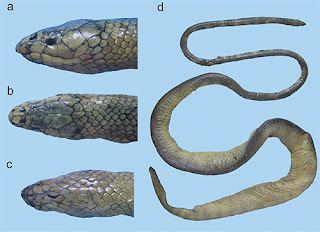 (2000) found that it was occasionally collected with other homalopsids during the snake harvest at Tonlé Sap, Cambodia. This species made up a small percentage of the catch and was not considered useful for human or crocodile food. Nor, was it used for leather products. When caught it was frequently discarded because of the belief it was poisonous. He (Stuart, 2004) also noted it was collected by fishermen in the Mekong Delta. Morice (1875b) noted that the Annamites consider this species venomous, writing, "The bite is thought to cause an endless sleep, from which even a beating would not awaken one, and which would end slowly in death." The cryptic posture of this species was described by Smith (1943) he wrote, “When this snake is handled it does not attempt to bite or escape, instead it stiffens its body, a habitat that has earned for it the Thai name of “ngu kradan” or the “snake like a board.” A captive snake placed in an aquarium with one floating water hyacinth proved to be remarkably cryptic. Its body posture and coloration combine to make it appear part of the vegetation. Its cryptic nature is also enhanced by the growth of algae on the skin. When placed in clean water the symbiotic algae is readily visible and the fish (Betta splendens) in the aquarium would graze along the snake’s body, thus besides serving as camouflage the algae may also serve to attract prey. Smith (1914b) considered tentaculatus uncommon in Bangkok, but noted its presence in waterways in surrounding areas. And, he (Smith, 1943) later wrote, "It is not uncommon in ponds and sluggish waters in the country round Bangkok if one knows where to look for it, and, according to Bourret it is not rare in Cambodia and Cochin China.” In Cambodia, Saint Girons and Pfeffer (1972) noted an absence of this snake during the wet season, and suggested they become inactive during the dry season. Erpeton was considered an early divergence from the homalopsid stem by Gyi (1970), and indeed as noted in the introduction Dowling et al. (1983) presented evidence that the Erpeton lineage diverged 45.2 MYA. Voris et al. (2002) analyzed mtDNA from 16 homalopsids including Erpeton and suggested Erpeton was in a clade with Enhydris bocourti, Cerberus, and Homalopsis.